Here is yet another novel learning opportunity for the teachers of the twin cities of Hyderabad and Secunderabad - Breaking Patterns, Creating Change, a 2-day training for teachers in Theatre of the Oppressed by Marc Weinblatt on January 29, 2011 and January 30, 2011. This workshop promises to be a life-changing, inspirational experience for participating members! 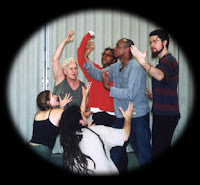 What is Theater of the Oppressed? Developed by Augusto Boal, the Brazilian visionary, Theater of the Oppressed (TO) is a form of community-based education. It is also a tool for transformation – of the individual, as well as groups and communities. TO invites critical thinking and authentic communication. It is about analyzing rather than accepting, questioning rather than giving answers. It is also about “acting” rather than just talking. Marc Weinblatt is the founder director of Mandala Center for Change, an international hub for the training and grassroots practice of TO. Marc regularly facilitates TO sessions working with diverse communities ranging from police and homeless youth to University professors! His work stems from his deep commitment to bringing a sense of spirit, humanity and social justice. These are qualities all of us as teachers need to urgently hone. During these 2 days participants will be trained with a range of theatre exercises to explore sensitivity, compassion and understanding of human interactions. We have very limited seats and so we urge you to hurry and confirm your school's participation! Participation Fee: Rs. 2000/- per head.